Be it for a recording studio or for a home stereo setup, having the best acoustic panels is essential to reduce reverberations and flesh out everything in the music. Soundproofing should probably precede acoustic treatment, though most panels and foams serve both purposes. Soundproofing prevents outside noise from coming in and inside noise from leaving the room. If you are building a studio, it should be done during or right after the building process. Acoustic treatment, on the other hand, is there to filter out the reflected sound and give you a clean recording sound. 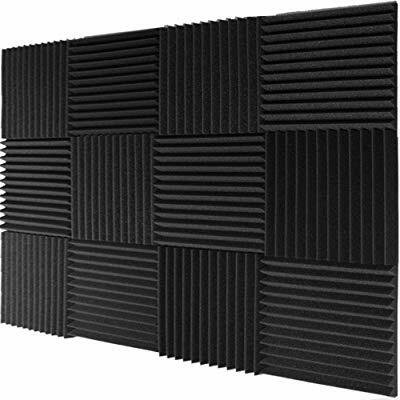 Here is a list of the best soundproofing foams and acoustic treatment options, consisting of 9 of my favorite solutions. How to Install Acoustic Treatment Panels? How to Deal with the Outside Noise? How to Deal with Inside Noises? The Foamily Studio Foam Wedges come in a twelve-pack at the smallest standard size – 1ft x 1ft. With all pieces combined, you’ll be able to cover 12 square feet of wall. They are also available in 24-packs and other thicknesses. These high-quality wedges come in a wide variety of colors, including Charcoal, Burgundy, Red, Burgundy/Charcoal, Blue, Blue/Charcoal, Olive/Charcoal, and Charcoal/Red. 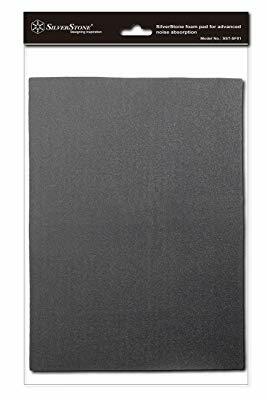 These wedge-shaped panels are 1” thick and effective at absorbing midrange and high frequencies. If you want more stopping power, you might want to consider bass traps or thicker acoustic panels. 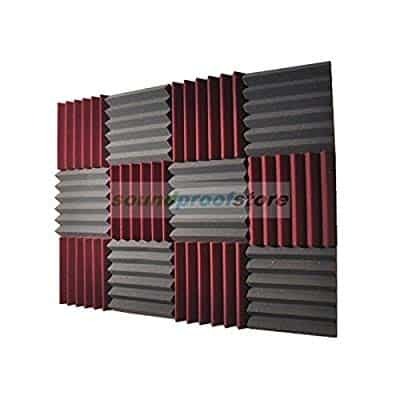 These panels are excellent at combating reverb and flutter echo, as well as sound dampening and noise reduction. They are intended for use in smaller to medium-sized rooms. Foamily’s Studio Foam Wedges are fire-retardant and made in the United States. They are great for light to intermediate level of acoustic treatment. If you are designing a home recording or rehearsal studio, these might be a good way to go. Auralex is one of the most prominent name in acoustic treatment, trusted by professionals and amateurs alike. Its Studiofoam Wedgies are made for spot treatment and come in a pack of 24. With the size of an individual panel at 1ft x 1ft and 2 inches thick, one pack is enough to cover 24 square feet of wall. Studiofoam Wedgies come with a class B fire rating. The official NRC (Noise Reduction Coefficient) is 0.80. The only available color option is charcoal gray. These wedge-shaped panels are a good choice if you need light to intermediate acoustic treatment and work best in combination with bass traps. I would recommend these for both home and professional studio acoustic treatments. Their size allows a wider range of placement options. 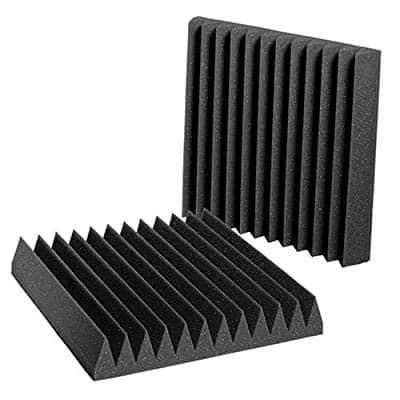 These affordable, wedge-shaped acoustic panels come in a pack of twelve 2” x 12” x 12” panels. With the entire pack in use, you’ll get twelve square feet of wall covered. Soundproof Store sells them in monochromatic and two-color sets. Various colors and patterns are available. The density of the panels is 1.2lbs per cubic feet, which is about the average for good absorption. 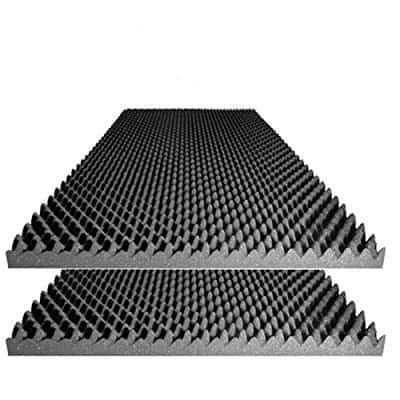 Soundproof Store’s 4492 acoustic wedge panels are made in the United States. The fire rating is class A class, meaning they can withstand a lot of heat before they blaze up. The 4492 Acoustic Wedge is best used for home studios, vocal booths, and rehearsal rooms. Owing to their 2” thickness, these panels are ineffective against lower frequencies. But then, you’re not supposed to use foams but bass traps to tame your bass. The Mybecca Studio Foam Wedges are made of polyurethane foam. They are 2”x12”x12” each and there are twelve of them in a single package. Altogether, the tiles will cover 12 square feet of wall. Like the majority of acoustic foams in this class, Mybecca’s Studio Foam Wedges are made for spot treatment and work best when combined with bass traps. They are best used for enhancing the recording quality vocal performances and videos. Mybecca’s Studio Foam Tiles are made in the United States and come in several color options. The foam wedges are available with either eight or twelve peaks. By simple geometry, you can see that the ones with eight peaks have more areas that are thicker but less curves. The NRC of these panels is rated between 0.7 and 0.8. The panels are compliant with California’s Technical Bulletin 117-2013. When it comes to creating the perfect environment for recording or listening to music, acoustic treatment and external soundproofing might not be enough. Sometimes, you have to silence the computers, A/C units, and other sources of noise within the studio. That’s where SilverStone Technology’s Silent Foam comes in. The Silent Foam is made of quality EPOM and available only in black. The standard package includes two panels, each of them at 530 mm (20.87”) long, 280mm (14.96”) wide, and 4mm (0.16”) thick. The foam is primarily made for sound dampening of computers. It is used in a similar way as wall panels, but instead of absorbing the reflections, it prevents the noise from leaving the computer. To dampen your PC case, cut the foam into pieces of appropriate sizes and glue them to the insides of the panels. The foam has adhesive on the back, so you won’t need glue. 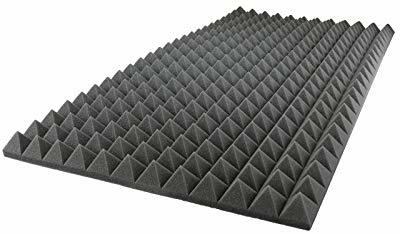 Pyramid is, along with wedge and egg crate, one of the most popular styles of acoustic treatment panels. It is also the style of choice for Foamily’s Pyramid Wall Panel. These Pyramid Wall Panels are sizable at 48” long, 24” wide, and 2” thick. They can replace eight standard 12” x 12” or four 24” x 12” panels. Foamily sells these in packs of one and two. Like the rest of 2” foams, Pyramid Wall Panel panels are intended for spot treatment. It should be combined with quality bass traps for optimal acoustic treatment. Aside from their main purpose, these panels can also be used as microphone diffusers. Though there are no official figures, Foamily claims that these panels have high NRC. Also, they are made in the United States and comply with California’s Technical Bulletin 117-2013. These panels are best used for home studios, garage rehearsal rooms, vocal booths, and control rooms. They are not that well suited for professional recording studios. If you’re an audiophile, they’d be great for your hifi room as well. These acoustic foams are designed for corner placement. Use at least 4 of them in a line in each corner and they’d be effective as bass traps as well. Bass traps are the most important element of acoustic treatment. They can solve the majority of acoustic problems, including the overemphasis of particular frequencies in the bass region. Since bass wavelengths are so long, bass traps can be very thick, such as these 12-inchers. Foamily sells them in only one color – black. Also, they come with only one peak pattern. You can buy them in packs of two, four, and eight. Thanks to their versatility, they can deal with the mid and high-range frequencies as well. If you have a small budget for acoustic treatment, these XL corner acoustic foams that can act as bass traps should be your priority. All Foamily acoustic products are fire retardant and made in the US. (As you can imagine, it’d not be cost-effective to ship foams all the way from China, so you’ll find that a lot of acoustic foams are made locally.) These are compliant with California’s Technical Bulletin 117-2013. Though often overlooked, especially in home studios, decoupling is very important. It prevents adjacent surfaces from transferring vibrations from one to another. That being said, it is especially important to decouple speakers from the desk or any other hard surface they might be standing on. These Monitor Isolation Pads by Studio Solutions are my favorite tool for the job. The pads are made of high-density foam (50kg per cubic meter) and measure 10.5” wide, 12.99” deep, and 1.5” high. They come in pairs and two pieces of foam per side (to accommodate various angle configurations). They are for use under 8” bookshelf speakers and monitors. These are basic pads, featuring no additional parts or materials. The foam is dense, though, and offers decent isolation. You can adjust the pads into five different angles. Foamily’s Egg Crate Wall Panel is one of my go-to options whenever I want to cover large portions of the wall. It features the egg crate style, which I prefer to pyramid. The Egg Crate Wall Panels are made of high-density foam and measure 48” long, 24” wide and 2.5” thick. The added thickness will work with a wider range of frequencies. These panels are best used for spot-treating walls. Recommended settings include recording studios, rehearsal rooms, and home stereo listening room. Foamily sells these in packs of one, two, or four. Several different color options are available, including Ice Blue, Charcoal, Red, and Burgundy. Like the rest of the Foamily range, the Egg Crate Wall Panels are made in the United States and comply with California’s Technical Bulletin 117-2013. 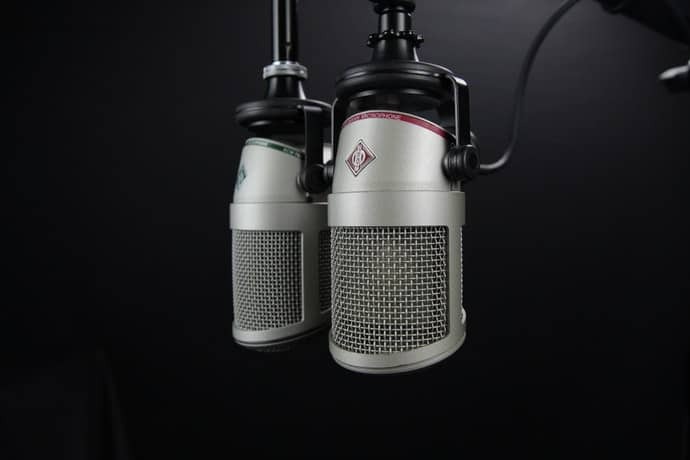 Be it a professional studio or your room, your recording microphone will pick up two types of sound – direct and reflected. Direct sound is the portion of sound which reaches the microphone without interacting with any of the surfaces in the room. It is clean and has its original frequency balance untouched. This is the sound you want to record. Reflected sound, on the other hand, has reached the microphone after reflecting off the surfaces in the room. Depending on the quality and the acoustic properties of said surfaces, reflected sound can change significantly before it reaches the microphone. For a small room, the sound could have been reflected hundreds of times. The job of acoustic treatment is to reduce the amounts of reflected sound which get to the microphone (and onto the record). Outside noise is the third type of sound which might get recorded along with your masterpiece. It includes all sounds which enter the recording room from the outside. 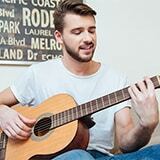 You can combat outside noise by soundproofing your recording room. The fourth type of sound that usually gets recorded is internal noise. It is the noise created by computers, AC units, footsteps, breathing, and others. You can use a combination of damping, decoupling, isolation, and other techniques to minimize internal noises. Acoustic treatment is there to control sound reflections in a room. Its goal is to improve the recording sound by removing the reflected sound. Acoustic treatment will not, however, prevent the sound from exiting or entering your room. That’s what soundproofing is for. To achieve a good sound quality, you should make sure to minimize the natural reverb in your recording room. There are three main ways to do it – bass traps, acoustic panels, and diffusors. There will be more on each of them later. Of course, if you overdo it, you might remove the reverb and sound reflections completely. That’s a sure-fire way to deaden the sound and make your recordings dry and void of dynamics. Now, before you start installing acoustic treatment panels, there are things that you should know about walls and corners and their roles in the acoustics of your room. Every recording room can be split into three types of areas – trihedral corners, dihedral corners, and walls. Trihedral corners are spots where three walls come together (the ceiling and floor corners). Dihedral corners are areas where two walls meet. Finally, walls are flat surfaces. Trihedral corners should be the first on the list. They have three sets of walls converging and catch the modes from three dimensions. This means that panels installed there will be three times as effective. Bass traps are most usually installed in trihedral corners. Next, you should deal with dihedral corners. Regular wall panels should do the trick here. You should bend the panels around the edge, but make sure there’s a gap between the panel and the walls to maximize the absorption of bass frequencies. When the dihedral corners are done, you should start working on the walls. Usually, your recording room will have two sets of parallel vertical walls with four 90-degree angles between them. If that’s the case, you should treat them in pairs. That’s because sound waves reflect at the same spots when the walls are parallel. The problem here is that some frequencies get amplified, while the others get canceled out when reverberating between parallel walls. Lastly, you should install some diffusors. These are installed on and near the ceiling. Diffusors are usually made of wood and are pretty expensive. That’s why many studios, including some professional ones, don’t have them. If you have the funds, go for them. Otherwise, you’ll have to take the DIY route or skip this step entirely. As opposed to acoustic treatment (which is about improving the sound), soundproofing is about preventing outside noise from getting into the room. Also, it keeps the inside noise in, which is very convenient if your studio is in an apartment building. Generally, there are four main strategies for isolating your room from outside noise – you can add mass, use damping, and make the room as airtight as possible. Here’s how each of them works. If you’re building a studio from the ground up, make sure the walls are thick and made of dense materials. If, on the other hand, you intend to record in a room with walls of regular thickness, you’ll need to add some mass to them to prevent them from letting the sounds in or out. A common way to add mass to the walls is by way of Sheetblok, a type of heavy, mass-loaded vinyl. Both pros and amateurs use it. Please note that this soundproofing should be installed before any acoustic treatment panels. Damping is used to dissipate the kinetic energy of a sound wave and turn it into heat. It is done by inserting dampers (glue is the most popular damping material nowadays) between a pair of rigid panels. Next, you should deal with the air gaps, as even the smallest ones can let unwanted noise into your studio. You can use acoustical caulk for cracks and holes and foam gaskets for the gaps around windows and electrical outlets. Also, you should close the space under the door of your room. Lastly, you can use soundproof curtains to prevent outside noise from entering through windows. After you’ve dealt with the outside noise, it is time to minimize inside noises. While you can make your room airtight and block out all outside noises, you’ll never be able to get rid of all the inside noises. That being said, two most common sources of inside noise are computers and ACs. When it comes to AC noises, there are several things you can do. You should close all the gaps and cracks, as noises from the outside can easily get into the room. Take the vents off the ducts to prevent them from rattling and resonating at certain frequencies. Lastly, you can use some spare wood/plywood/plastic panels and acoustic treatment foam to make sound dampeners and reduce the noise. The first thing to do with computers is to increase the level of acoustic separation. You can do this by placing the microphone as far away from the computer as possible. Also, make sure to turn it away from the computer. Cardioid microphones are great for this. Some dynamic microphones with low gain can be good too. Applying acoustic treatment on the wall behind the singer can reduce the amount of computer noise on the recording as well. If you’re recording with a laptop, you can try using a stand. That way, you’ll give it more room to breathe and less reasons to use the fan to cool itself. If you’re working with a desktop PC, you can put the tower in a box to isolate it. You can choose to buy one or make one yourself. The downside of the box is that it can get very hot in there very quickly. The last thing you can do with a computer is to move it to another room. That only works with desktop computers and if you have additional rooms at your disposal. Of course, if you opt for relocation, you’ll most likely have to deal with cable extenders. There’s another thing that you can do about inside noise - decoupling. It is used to isolate the items in your room and prevent them from transferring vibrations onto each other. Rubber and plastic foams are the most common materials used for decoupling. If you’re building a studio and want to get serious about decoupling, there are several additional options. You can build a floating floor with rubber isolators, double walls (with insulation between them), floating ceiling and walls, and more. Bass traps, as their name suggests, are there to absorb low frequencies. Despite their name, they’re also good at absorbing mid and high frequency soundwaves. Due to the much longer low frequency wavelengths, anything that can treat low frequencies can also treat mid and high frequencies, but not the other way round. Like acoustic panels and sound diffusers, bass traps treat the acoustics of the room. There are two major variants of bass traps – porous and resonant. The former type relies on mass and density to deal with low frequencies, while the latter utilizes sympathetic resonance of installed diaphragms to catch the low-end waves. Porous bass traps are the most common type of traps and you’ll see them in both professional and home studios. They are usually made of fiberglass, rockwool, or acoustic foam. Some of them use more than one material in layers. Porous traps are relatively affordable and good at dealing with flutter echo, standing waves, room modes, and other common issues. They are usually triangular, flat, or cylindrical. The triangular ones rely on size and mass to deal with bass frequencies, while the flat ones utilize the space between them and the walls to get the job done. Whichever you choose, make sure to first cover your room’s trihedral corners and then the dihedral ones. Use acoustic panels for the walls. However, many commercially available traps can’t deal with super-low frequencies. They are either too thin or can’t be placed far enough from the wall. For example, to efficiently absorb a 50Hz wave (22.51’ long), your trap would have to be 5.62’ thick or that far from the wall. The traps are most efficient at the wave’s maximum velocity, which is at a quarter of the wavelength. Resonant absorbers, on the other hand, are focused on low-end frequencies and are pretty much useless with mid and high frequencies. While porous traps work best when there’s space between them and the wall, resonant absorbers are best installed against the walls. This is due to the sound pressure being at its highest there. There are two popular kinds of resonant absorbers – Helmholtz resonators and diaphragmatic absorbers. The former use ports to trap frequencies into airtight cavities. The latter utilize vibrating membranes or panels. Depending on what you’re aiming for, you can use porous absorbers, resonant absorbers, or a combination of the two. Porous absorbers will give you a drier sound, while resonant absorbers will give you a more spacious sound. You should also take expenses into account as resonant absorbers can be very expensive. Acoustic panels are, along with bass traps and diffusors, the main elements of acoustic treatment. They are usually installed on the walls and serve to absorb mid and high frequencies. Commonly, they are made of acoustic foam, though homemade panels can feature various materials. 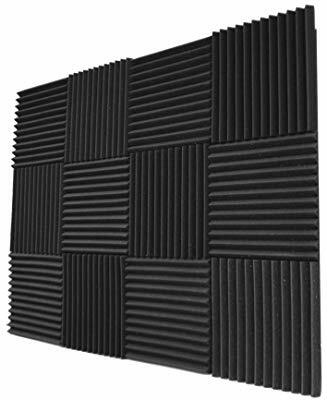 If you decide to go the commercial route (which I would strongly recommend if you’re making/building your first studio) for your acoustic panels, there are some things you will need to consider. They include the size, thickness, NRC/SRC rating, and patterns. Acoustic panels are commonly sold in packs and you will have to consider both the individual panel size and the total wall area that you need to cover. The individual panels come in three common sizes – 1ft x 1ft, 1ft x 2ft, and 2ft x 4ft. If you decide on the 1ft x 1ft panels, you will most likely get them in packs of 12 or 24. 1ft x 2ft panels are usually sold in packs of 12, while the biggest ones are commonly available in packs of 2, 4, and 8. Of course, you might come across other combinations. When it comes to the thickness of acoustic panels, 1”, 2” and 4” are common. As with the bass traps, thicker panels absorb lower frequencies of longer wavelengths. That being said, 2” acoustic panels are the most popular. They offer quite a good range and are more affordable. Also, if you combine them with quality bass traps, you won’t need the extra thick panels. NRC, or Noise Reduction Coefficient is a measure of how effective an acoustic panel is at absorbing sound. Like all other coefficients, it ranges from 0 to 1, with zero being 0% absorption and 1 being full 100% absorption. Standard NRC tests are conducted for only four frequencies – 250Hz, 500Hz, 1kHz, and 2kHz. SRC, or Sound Absorption Coefficient, measures how much sound a particular material (acoustic panel in this case) can absorb. It ranges from 0 to 1, with 0 being 0% and 1 being 100%. The good thing about the SRC is that it gives a much clearer picture of panel performance. The bad thing about it is that most manufacturers don’t use it. Egg crate, pyramid, and wedge are three of the most commonly used patterns. While there are differences in absorption pattern, they are almost undetectable. 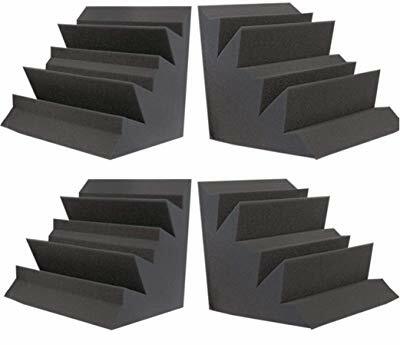 If you have already installed some bass traps, you can proceed with covering the walls and open portions of dihedral angles with acoustic foam. The number of panels needed directly depends on the quality of acoustics in your room. The better it is, the fewer panels you will need. Usually, the percentage of the wall area you will need to cover will be anywhere from 20 to 80%. The percentage differs from room to room and can only be determined by measuring the reverb after every installed panel. A good strategy of completely covering opposing walls is to cover them in a checkered pattern where one panel on wall A looks at an uncovered section on wall B. Here is a YouTube video with instructions if you intend to take the DIY route and make your own acoustic panels. Diffusors are the third major component of acoustic treatment. While bass traps take over the corners and acoustic foam panels the walls, ceilings and upper portions of the walls are reserved for diffusors. The main purpose of diffusors is to scatter the reflections and prevent the bass traps and acoustic panels from deadening the sound completely. They are mainly made of wood and can be very expensive. That’s why you won’t see them in many studios. But, if combined with bass traps and acoustic panels, they can give your studio top-notch acoustics. Monitor isolation pads are your best ally for decoupling. They are there to separate your studio monitors from the desk and remedy the muddiness in the bass range (which is a consequence of vibration transfer between them). 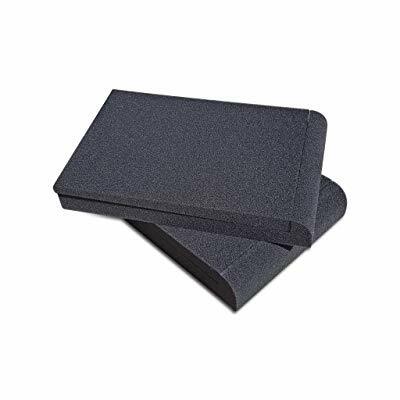 Monitor isolation pads come in many shapes and forms, with the most basic ones being made of two pieces of dense acoustic foam. Additionally, they can feature urethane foam layers on the bottom to help acoustic isolation. Some might feature neoprene covers to aid in shock absorption and prevent slippage. The more elaborate models can even feature replaceable parts and custom height/angle adjustment. An even better solution is to take your studio monitors off the desk and put them on a pair of high quality speaker stands. These stands decouple by way of heavy mass and two levels of spikes (floor and top plate). 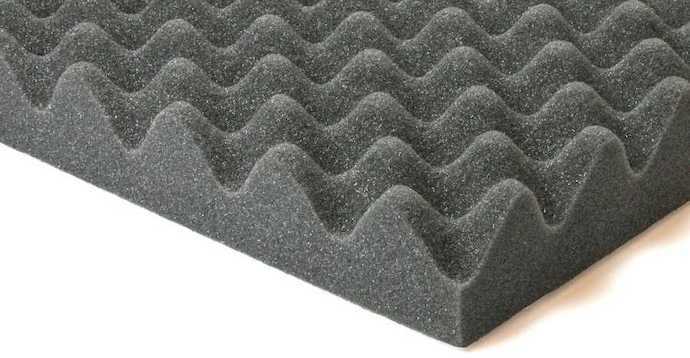 The best soundproofing foams / acoustic panels are indispensable for any serious studio. While it may be hard to choose the right options, I hope these picks will give you a good place to start.